German car giant Volkswagen defied global headwinds for the industry to report soaring third-quarter profits Tuesday, emerging at least partly from the shadow of its "dieselgate" emissions cheating scandal. Net profit at the Wolfsburg-based group more than doubled year-on-year between July and September, to 2.76 billion euros ($3.14 billion)—but still fell short of analysts' expectations. In the third quarter of 2017, the bottom line was badly hit by one-off costs of 2.6 billion euros, as a US recall of cars with diesel engines configured to cheat regulatory emissions tests proved more complicated than expected. On Thursday, German consumer advocates are set to launch a collective legal action against the group, the first brought under a law introduced specifically by Berlin to help VW buyers. This quarter, though, it was new EU emissions tests known as WLTP—introduced after the trickery affecting 11 million vehicles worldwide was uncovered—that weighed on the firm's result. VW countered that operating profit over the first nine months was "on par" with last year's figure, saying that "strong development in the first half of the year and during the summer months was able to compensate for September's decline in deliveries, which was mainly caused by the WLTP transition." Other manufacturers have also complained of a bottleneck caused by the new tests, which are designed to better reflect cars' output of harmful gases like nitrogen oxides (NOx) in real on-road driving conditions. VW's confidence that it would meet its full-year forecast—with unit sales slightly higher than in 2017 and revenues "as much as five percent" above last year's 230.7 billion euros—stood out compared with German rivals like BMW and Mercedes-Benz maker Daimler. Both the high-end carmakers have issued profit warnings in recent weeks, blaming the WLTP testing regime, trade tensions between the United States and China and their own entanglements with the authorities over diesel. 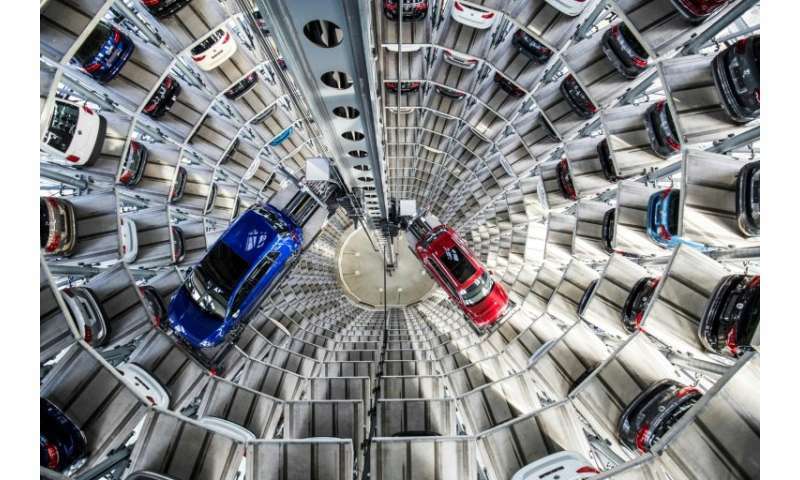 "Everyone is running around with profit warnings and VW—who had the biggest problems with WLTP—is holding steady," industry analyst Ferdinand Dudenhoeffer of the Center for Automotive Research told AFP. He added that new chief executive Herbert Diess "is already beginning to exploit VW's potential more fully" than predecessor Matthias Mueller, the crisis firefighter installed in the wake of the firm's 2015 diesel cheating confession. Investors rewarded VW's comparative resilience Tuesday, with the group's stock shooting to the top of the DAX index of blue-chip German shares in morning trading, adding 3.1 percent at 146.82 euros. "We see the company well on track" to hit its target for a profit margin adjusted for special items of between 6.5 and 7.5 percent, analyst Tim Schuldt of Equinet said. The outlook for European carmakers has brightened slightly since Monday, as Bloomberg News reported vital market China was mulling a 50-percent tax cut on new cars to cushion the impact of its trade battle with the US.